We could all do with a big of balance at the moment, couldn’t we? 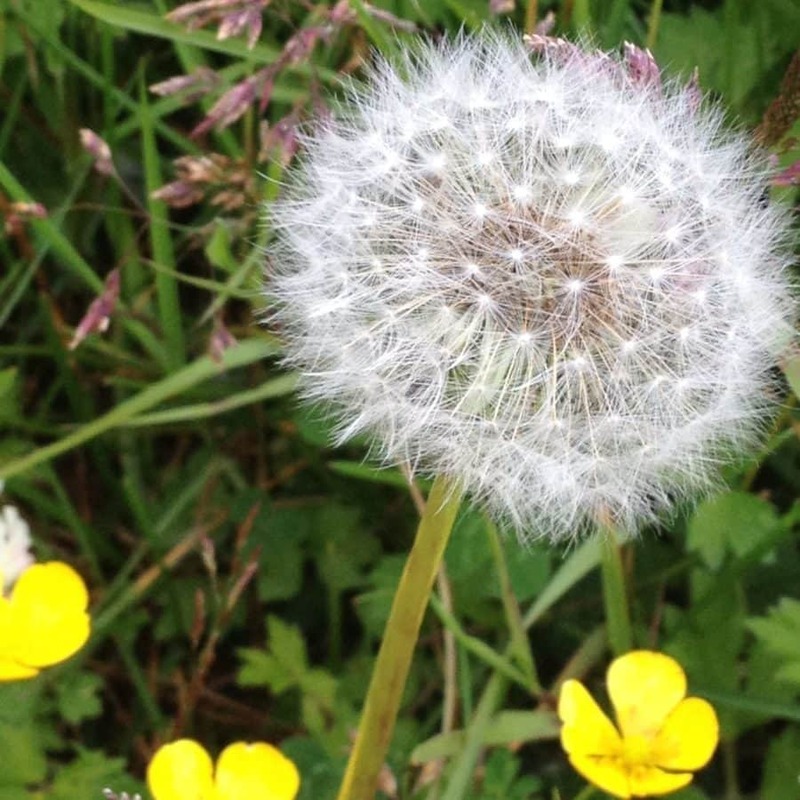 With so much up in the air and so much of the skewed in the world at large – I aim for us to have a wee bit of balance over here in our little corner! I have got a meaningful knit story for you, (which was recovered from the big laptop death!) 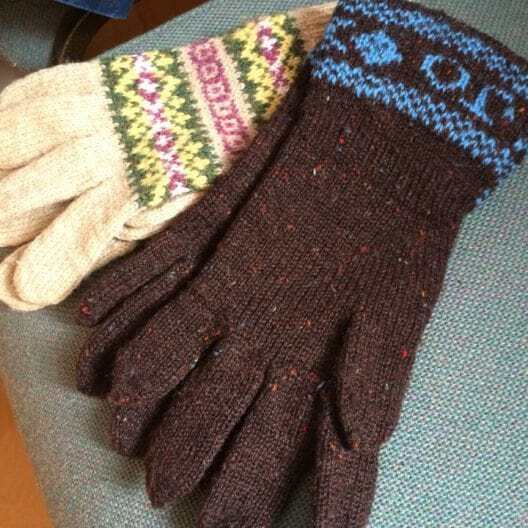 last year I spoke to Joanna Mouatt about two pairs of mittens her late Grannie made for her. There is also a Tale of the WIPs of Dooooom – cos balance! – from my woolly mucker Felix Ford. All of this and Book of Haps-along and more! 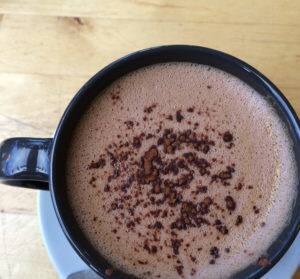 Thanks so much for your kind comments and connections since the last podcast and on the visit to The Border Mill! I hope you are ready for a good old catch up and a newsier episode. Since the podcast took a break the phenomenal Book Of Haps, from Kate Davies has been published. For anyone not aware of this book (And where hae you been?) Kate commissioned 12 designers to create their vision of a hap shawl – that traditional shawl from Shetland – the resulting designs embrace the versatility, knitability and wearability of the hap and, along with interesting constructions and stitch patterns, show how elegant, fine, modern, fresh, classic and down right awesome this humble item can be! I wasn’t going to host anymore KALs this year, but from a bit of arm twisting from Kate…#BookofHapsalong was launched! 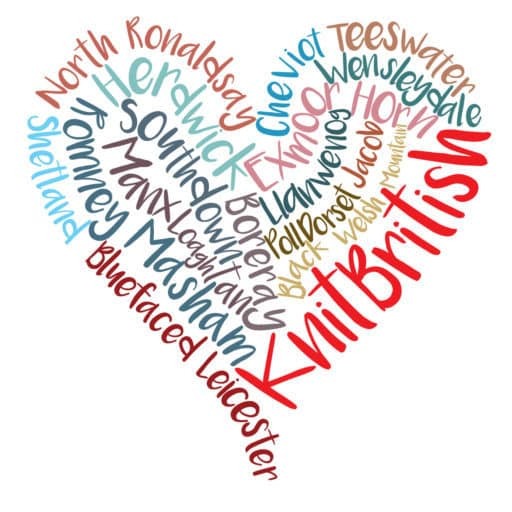 There are going to be prizes for the a hap made in British wool and a hap made in local to you yarn (non-UK) and the deadline to be in with a chance of winning a prize is 11.59 pm (UK) Sunday 14th August. Fear not though, I am very relaxed about this and you can keep on knitting haps until Saturday 24th September, to give multi-happers and slow knitters like me a chance to finish! Jen Arnall Culliford is also hosting a hap KAL #hapsarehappening and we shall have a prize for one lucky person who took part in both our KALs! Details of prizes will be revealed soon! | Balance – Meaningful Knit and Tales of the WIPs of Doooooom! Joanna Mouatt is originally from Shetland and now lives in Oslo. She brought two pairs of gloves knitted for her by her late granny, Joan Mouat of Unst. Joanna used to wear the gloves, they are resplendent with holes from wear, but since her granny died, she has kept these in a box. She said she doesn’t want to darn them rather keep them as they are. One pair feature a traditional design all over the back of the hand and the pair on the right are knitted with a double cuff and Joanna’s name. Twelve years ago Joan had made Joanna a pair of gloves in laceweight, featuring a snowflake design, but she lost them. After that time her granny started knitting Joanna’s name into the cuffs! These gloves have been worn and loved and now, no less loved, they are a special reminder of Joanna’s granny. We recorded this at Shetland Wool Week last year and Joanna had taken a class on knitting gloves; she said she may recreate these gloves herself one day. I think there is a lovely full circle in that. My woolly mucker, Felix Ford, aka KNITSONIK has been visiting this week and we shall be working on our Wovember plans. I thought it would be apt to share Felix’s WIP of Doom, recorded on her last stay here. Ever had some incredible yarns, with meaning, from an awesome seller or mill? Ever wanted to make something special with those special yarns? Felix will tell you why her special WIP still isn’t finished. It is a beautiful design, as you can see, but sometimes our WIPs just fail to become FOs. Remember my podcast on making time to work on your unloved WIPs or else have the courage to rip them out and free your yarn? Well, my good pal Leona, from Fluph, and I hit on an idea. If you are too scared, or a bit worried about ripping out your unloved WIPs, then we are gonna help you! On Saturday 3rd September we are holding a big WIP rip in Fluph, Dundee. Come on over and bring your WIPs out of hiding. Look them over and if there is nothing for it but ripping/frogging then we will help you. It can be so hard to make the decision to rip, never mind do the actual ripping. If you can’t do it we will. Make a small donation to MSF P/hop and we will rip, lend moral support and make you tea. At the end of the afternoon, you go home with newly freed yarn and a whole heap of potential – it is almost sweater season, after all! Can’t make it to Dundee, well of course you all can’t! BUT YOU CAN STILL JOIN IN! Use the hashtag #bigwiprip on social media, show off the items you plan to rip out and on Saturday 3rd September, get some pals over and have your own big WIP rip session – rip with wild abandon! Whether it is support group/hand-hold session for getting the ripping done or a ripping party – have fun! You could even make a small donation to P/hop yourself, something to offset the pain of ripping with all the hours of pleasure you will now have in knitting your freed yarn! Watch out for more info on this soon – including some visual feasting for the eyes from Leona, who will be vlogging on her WIP – the mahoosive Scollay cardigan! I am going to be at the Scottish Small Holder’s Festival in September at the Lanark Agricultural Centre. 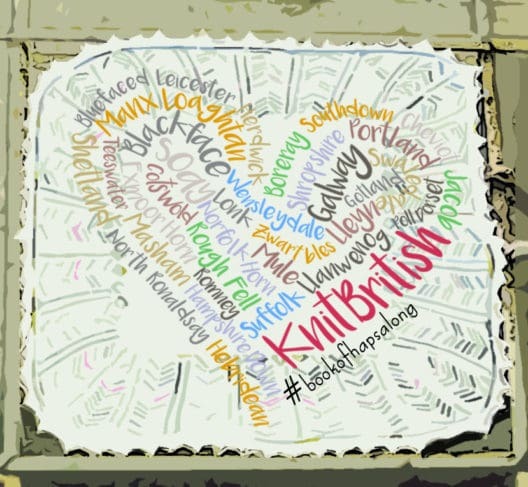 There will be a KnitBritish table with lots of British wool samples – from fleece to fabric – and we will have a little knitting area too. 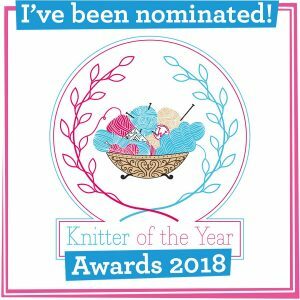 If you are looking for a nice knitty day out come and join me and bring your British breed knits and we could show them off and show small holders how awesome breed wool is and how we covet it as knitters! The event is, in part, organised by Rosemary Champion (The Accidental Small Holder) and the festival will feature livestock, poultry, crafts, produce and trade exhibitors. If you fancy coming along and entering your animals or craft or produce for the competitive element then visit the website for details. The Lanark centre is about a mile from the Lanark train station and would be a pretty nice event for a day trip! | What’s to come – BAGS! The incredible Knitting Goddess – Joy McMillan – and I have collaborated on some delicious project bags. At the time of recording the podcast there were both large and medium sized project bags. The large can hold 6 x 100g skeins/cakes of wool and the other 3 x 100g. They are made by Joy in heavy weight Fair Trade organic cotton and use dyes approved by the Soil Association. I am so very chuffed with these gorgeous bags and my nut-hap currently resides in mine. They cost £25 and if you are interested there are just a few left in the shop! The last update sold out really quickly. This is a really lovely collaboration and there is more to come from Joy and I! Watch this space! Come back on 12th August when the podcast returns – I will be looking at Jamieson and Smith Natural Heritage range and looking forward to my summer holiday trip! | Information Music: Carefree by Kevin McLeod on FreeMusicArchive and shared under Creative Commons Attribution license. Felix’s WIP of Doom images belong to her. 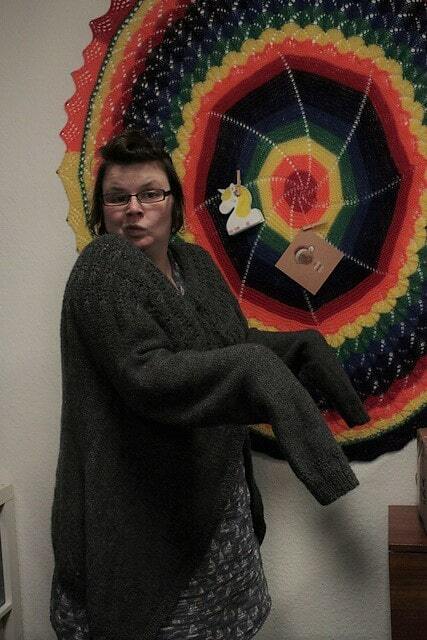 Leona’s mahoosive Scollay image belongs to her and The Knitting Goddess bags images belong to Joy McMillan. Other images were taken by me! Your email has cheered me up no end. Feeling very sorry for myself, having been bitten by a false black widow spider in my garden. Bed rest with elevated ankle and can’t even be bothered to knit!!!!!!! Hubby making me a coffee and I’m about to lose myself in the wooly loveliness that is your podcast! aw noooo! I hope the spider felt really awful for biting you. Feel better soon! Loved this episode and I want to join in the chorus saying we’re happy you’re back. I was just learning what a podcast was when you took your break, but I’ve caught up on all the previous episodes now and am delighted to listen “live”! I love the idea of the Big WIP Rip… Except that I don’t have any. No project bags lurking in cupboards, hiding behind sofas or festering under the stairs. Yesterday I had four WIPs, all active. Now one is finished and blocking, another is ready for grafting in the morning, and the other two are coming in holiday with me (although taking a cream hexa hap to a large field might not be the wisest choice?!! Maybe I need to cast on something else?). 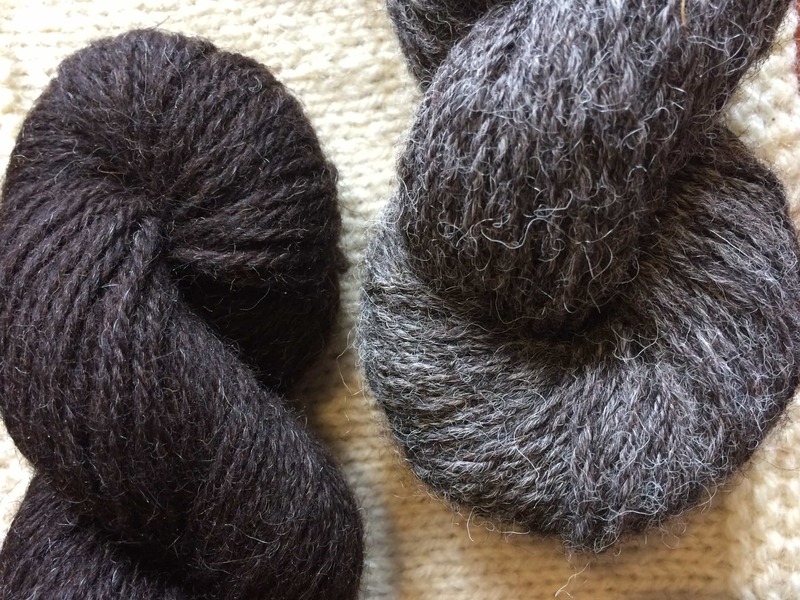 I had a nice chat with The Border Mill down at Fibre East – and they were so impressed, both with you, and the magical way you made them clearly audible about the loud mill noises.